The Doctor typically pays me an “Annual Visit” as he navigates East to West or West to East on one of his ventures. I was excited; a little work, a little food and a lot of great conversation. We had prepared an 09 KLR Project Bike for the Doctor in 2009 and it appeared a little maintenance was in line. The 09 KLR Project Bike build included Happy Trail Teton Aluminum Panniers, Odyssey Battery Kit (which is still cranking everyday), Fork Brace, PD Nerf with Skid Plate, T2 Tail Plate along with a host of other modifications to the KLR. As I was thinking about the upcoming work on the 09 KLR Project Bike I got to thinking about the A Model KLR Doctor Frazier had dubbed his ‘round the world KLR™650. The A Model KLR had served well and had taken Doctor Frazier around the world in 2002. I came across the ROK Accelerate Magazine article A Road Warrior's Final Ride. that gives more details on the KLR. Check out the article and I will get back to you on the “Chain Gang’s” performance later. 09 KLR Project in the background, the Doctor is working on an R100 GS with electrical gremlins! This entry was posted in Adventure Motorcycling, Bike Tech on October 7, 2016 by Fairly Inarticualte Tim Bernard. This is a 126 mile loop starting and ending at Lewis & Clark Resort near Kamiah. The Elk City Wagon Road is picked up at Clear Creek and is followed to Elk City with the exception of two detours to Corral Hill Lookout and Pilot Knob Lookout. This entry was posted in Adventure Motorcycling on September 18, 2016 by Fairly Inarticualte Tim Bernard. This entry was posted in Adventure Motorcycling on September 15, 2016 by Fairly Inarticualte Tim Bernard. Hopefully you have made reservations at Challis Hot Springs and you have your Adventure Motorcycle or your Dual Sport ready go. The first stop you want to make in the Challis area is the Land of the Yankee Fork State Park information located near the intersection of Highways 93 & 75. Visit the museum and visitor center, for guided and self-guided tours of Yankee Fork dredge, Sunbeam Dam, Challis Bison Kill Site, travel the Custer Motorway Adventure road and explore ghost towns of Custer. They have plenty of printed of material about the area. This entry was posted in Adventure Motorcycling on September 2, 2016 by Fairly Inarticualte Tim Bernard. 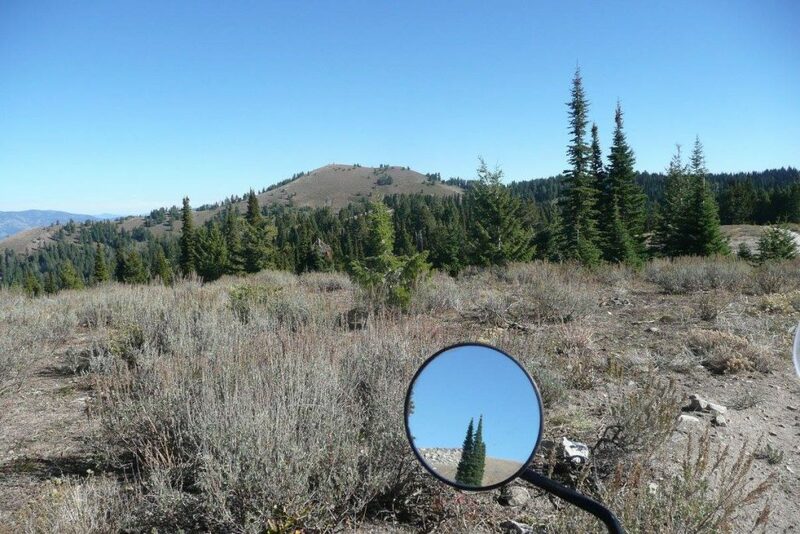 This 'Adventure Motorcycle Ride' is in the area of what is called the Boise Front and the Boise Back. The Boise Front consists of the foothills and the mountains that are on the edge of Boise. Rocky Canyon Road starts in the City limits of Boise and is one of several routes to the Boise Ridge. The Boise Ridge has four main peaks; at the south end is Lucky Peak at 5904 feet, Boise Peak at 6490 feet, Doe Point at 7057 feet and Shafer Butte is on the north end at 7572. Doe Point and Shafer Butte are part of the Bogus Basin ski area. This entry was posted in Adventure Motorcycling on June 13, 2016 by Fairly Inarticualte Tim Bernard. This entry was posted in Adventure Motorcycling on May 20, 2016 by Fairly Inarticualte Tim Bernard. This ride was 155 mile (my odometer showed 160.6) round trip from Boise, total time for the trip was 9:07 hours. 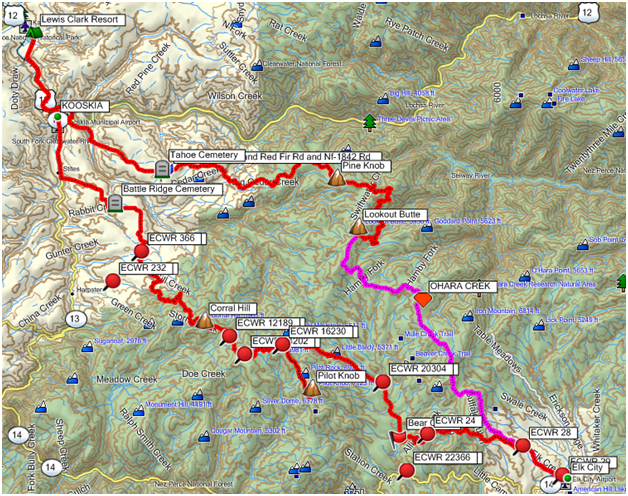 This day trip would take us from the Boise Valley through the ‘Boise Basin” and Back. The Boise Basin is just over the ridge and consists of the Gold Rush mining communities making up Boise County. The elevation ranges from 2750 feet in Boise to a high of 6050 feet at mile 44. You can see from the vertical profile in the chart below that the day consisted of a medley of valleys, basins and ridges. This entry was posted in Adventure Motorcycling on May 10, 2016 by Fairly Inarticualte Tim Bernard. This was a ride we did in 2010 from Boise to watch Big Nasty Hill Climb.......Welcome to the Big Nasty Dual Sport Ride sponsored by Happy Trails products at www.happy-trail.com. This ride is for Dual Sport and Adventure Bikes only. On the ride you will encounter city streets, dirt roads, two track roads and paved roads. Please be advised that this is an enjoyable ride and not a race. You need to ride with caution and be expecting oncoming traffic at all times. This entry was posted in CMA, Tim Says ..., Adventure Motorcycling on September 17, 2010 by admin.